A children's book about cosmogenesis? Oh yeah! 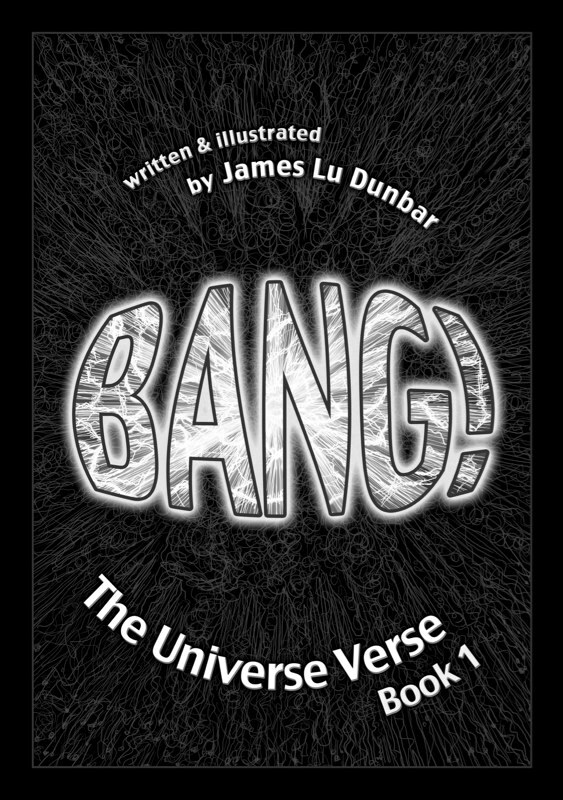 Recently I was contacted by James Dunbar about his new comic book BANG! where it seems he’s doing some good ol’ self-promotion of it. James seems to have send an email to a number of people including me, explaining the concept and providing a link to the free online version of the book. I promised I’d take a look when time allows and here I am. BANG! reads like a children’s book, with a rhyming style and lots of pictures. It tries to explain cosmogenesis and the Big Bang theory in as simple terms as possible. Unfortunately, even though the effort is admirable, the complex concepts within the book are unlikely to be grasped by children (although, of course, I could be wrong. I have to run this by my girlfriend who’s dealing with children’s books a lot). I guess it would make a good gift for teenagers but I’m afraid that the style might turn them off as it might sound like it’s made for a younger audience. It seems to me that it’s a difficult situation where the style is made for the young while the content is made for the older, therefore making it hard to use by either. Nevertheless the concept is very well done, the large majority of the rhymes work and the art is pretty good in itself. As an adult, I enjoyed the simple and concise way it presented those complex concepts in ways that made them look as interesting as they really are. Being a children’s book does not mean that it’s not enjoyable by adults. Plus, I am really curious to see how children will actually react to it (if you have any practical examples, do tell). The only thing that dissapointed me is that James opted to go for copyrights and place big scary copyright warnings all over the place. He should have realized that the value of his work does not lie in the ability to replicate it, which is in fact why he’s allowing everyone to read it online and sends it away as a promotion. The value of the book lies in being able to sell paper backs, and this would not have been prevented had he licensed it under a Creative Commons license.Hopefully he’ll change his mind in the future and follow a similar tactic like Cory Doctorow who gives away all his books for free online under CC licenses. Not only do you make it far less controversial for people to promote your work via sharing and posting online (as they do not have to fear about violating your copyrights) but you also create goodwill about your name. Re: Unfortunately, even though the effort is admirable, the complex concepts within the book are unlikely to be grasped by children (although, of course, I could be wrong. I'm not sure what you mean by copyrights all over the place, though. I have my copy here on my desk with me, and I only see a copyright on the inside front cover, like every other published book. My kids (ages 8 and 7) had no trouble with it. Ah, ok. Good to know and I'm glad I was wrong. and I only see a copyright on the inside front cover, like every other published book. The PDF I received had a copyright notice on every page iirc so perhaps simply the printed version differs. omg, I was classmates with the author for four years in high school. Serious coincidence! This will be perfect for my 8 year-old and even his little brother. James Dunbar is not recognized in my library's system. I'll have to change that. Aren't the publishing companies hostile to GPL, CC, and the like. How does one go about having a book published but also available online under a CC license without angering the publisher? Depends on the publishing company. I know that Cory Doctorow still publishes on paper even though he's giving them away for free online. Plus, I think James is self-published.